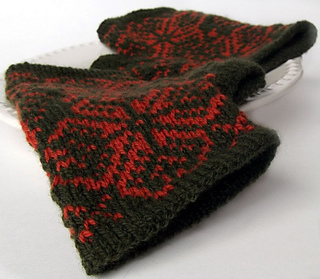 Also available as part of Winter Wonderland Knits! 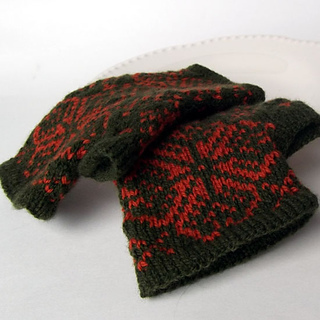 Colorwork motifs inspired by traditional Scandinavian and Fair Isle colorwork techniques. 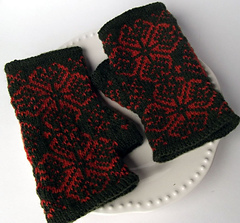 Fancy motifs are on both front and back while trees grace the thumb gusset and sides of these reversible wrist warmers. Simple but perfect hems are knit to keep the edges from curling or flaring out. Women’s size medium. Finished size 7 ½ inches around and 7 ½ inches long after blocking. Thumb opening up to 2 ½ inches around. Hems: It is not enough to simply switch to smaller needles to knit hems- flared hems are still often the result, especially for colorwork. This is solved easily by increasing or decreasing a few stiches before the hem so you have fewer hem stitches (which is what this pattern does). When seaming the finished hems be sure to take your time to line up the hem edges so you are stitching through the same row of stitches all across your hem to give an even, finished appearance to the hem and avoid puckers, flaring, and twisting. Blocking: One of the biggest problems people have with colorwork is in the finishing, when the hems are blocked incorrectly, causing a crease. The hem sections are twice as thick as the rest of the fabric, so when they dry after blocking or are ironed in it a good idea to place a washcloth or small piece of fabric inside- this helps smooth out the difference in thicknesses between hem and colorwork. 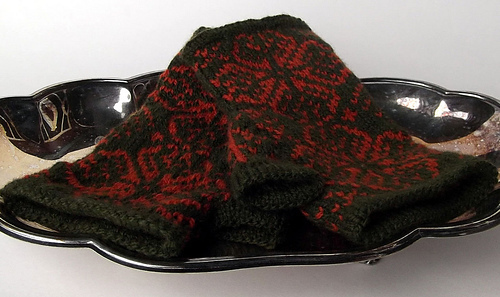 It is not always necessary to press (iron) the finished wrist warmers, but if you do wish to press them to give them a crisp wrinkle free finish, make sure to place a cloth between the iron and wrist warmers to prevent burning the fiber.